Research In Motion’s recent management shake-up had a number of moving parts — co-founders Mike Lazaridis and Jim Balsillie relinquishing their operational responsibilities, the ascension of co-Chief Operating Officer Thorsten Heins to CEO and the naming of director Barbara Stymiest to take over the company’s board chair position. Those were the big three. But there was one other that was equally important. 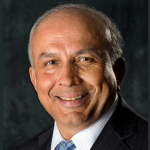 Adding Prem Watsa to the company’s board of directors. CEO of Fairfax Financial, Watsa has been described as the Canadian version of investing god Warren Buffett. So he brings considerable business acumen to RIM and a commitment to its success. But, more crucially, he brings a lot of the company’s stock. You see, Fairfax has been quietly buying up RIM shares for some time now. Today, it holds a 2.3 percent stake in the company. Which makes it RIM’s fourth-largest shareholder, after Lazaridis and Balsillie, who each hold about 5.1 percent of the company, and Primecap Management, which owns a 5.5 percent stake. And according to reports, Fairfax is planning to add to its position, a strategy driven by Watsa’s belief in the long-term value of the company. So what RIM has in Watsa is not just a savvy investor and highly strategic thinker, but a guy with a stake in the company that’s large enough when combined with those of Lazaridis and Balsillie to protect it from investors like Jaguar Financial, which have been pushing RIM to sell all or parts of its business, and to put an end to distracting takeover rumors.